Whether you’re taking a literary pilgrimage, embarking on a historical adventure or simply want to visit one of the most outstandingly beautiful areas of England, this day trip to Stratford-upon-Avon and the Cotswolds is truly unforgettable. First stop on the trip is the picturesque and richly historical town of Stratford-upon-Avon. Hometown to arguably the most revered writer on the planet, William Shakespeare, pay a visit to the beautiful half-timbered house within which the legendary playwright was born. Your expert guide will give you insights into his childhood and the way people lived back then. Next up, is a visit to Shakespeare’s bride Anne Hathaway’s cottage and gardens. An unassuming, quaint thatched farmhouse, this amazing piece of history features many original items of family furniture, including the Hathaway bed. Surrounded by stunning gardens, see where Shakespeare courted his future bride. From 1st April, you’ll get to explore where it all began for the world’s famous writer at Shakespeare’s schoolroom. Explore the inspiring surroundings that spurred him to become the incredible playwright that we now know him as! Walk in the Bard’s footsteps and learn of the lessons he would have taken. 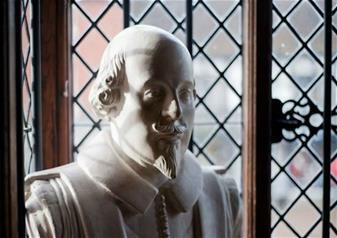 A fascinating insight into the early life of Shakespeare! The Cotswolds is an official Area of Outstanding Natural Beauty and the breathtaking scenery is dotted with tiny English villages that look like they have jumped out of a storybook. Enjoy photostops at Bibury, a town that William Morris once described as ‘the most beautiful village in England’, Bourton-on-the-Water, known as ‘Little Venice’ due to its series of low bridges and tidy stones. After a wonderful day of sightseeing, arrive back to London at the approximate time of 7:30pm.